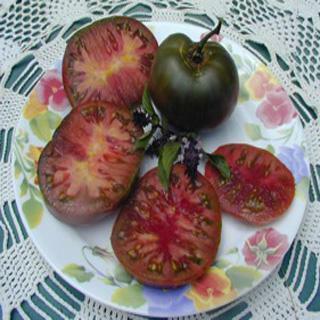 These tomato seeds produce very attractive fruits, 12 to 16 oz., purple-maroon, flattish beefsteaks with a wonderful, earthy richness common with the black types. Heirloom Seed Packet. Another potato leaf sister of Pink Brandywine. Very attractive fruits are 12 to 16 oz., purple-maroon, flattish beefsteaks with a wonderful, earthy richness common with the black types. Vines are quite vigorous and production has always been great for me.